The illustration shows the systematics of the height, depth and width pitches of the Intermas subracks. The height of the subracks are in Units [U]. 1 U is aquivalent to 44.45 mm. The nominal depth of the subracks is derived from the euroboard depth. Front inserted PCB’s are generally specified in 60 mm steps and for rear stucked PCB’s in 20 mm steps. For Intermas subracks depths in 10 mm-steps can be realized. The width pitch is stated in horizontal pitches [HP]. 1 HP is aquivalent to 5.08 mm. 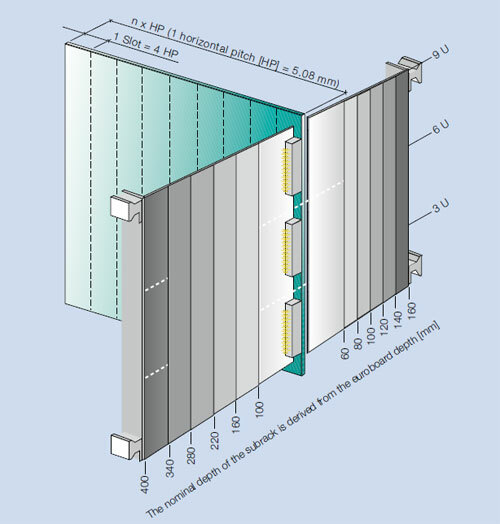 Busboards are specified in slots. 1 Slot is aquivalent to 4 HP = 20.32 mm.